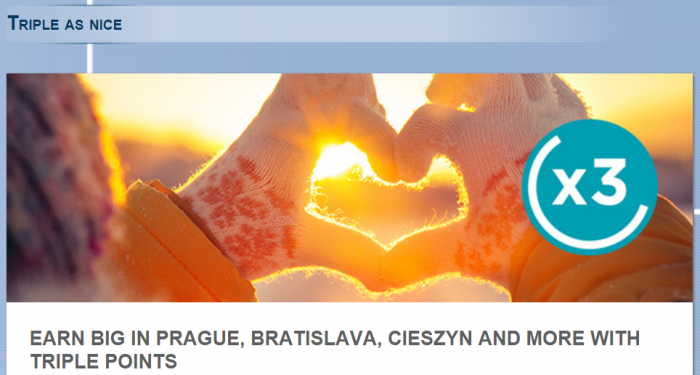 Le Club AccorHotels has launched a triple miles promotion for stays in select Czech, Slovak and Polish cities. The offer is valid for stays that are consumed between January 3 – March 31, 2016, and booked between January 1 – February 29. I like these offers that don’t require you to book any specific rate besides a point qualifying one. You do have to register and book within the specified period, however. 1. General Le Club AccorHotels terms and conditions apply to the Triple as nice offer and you must be Le Club AccorHotels member to benefit from it. To enjoy this offer, the Le Club Accorhotels loyalty program member must sign up by clicking on the “Benefit from this offer” button above (through 29/02/2016) and then follow the instructions. 2. This offer entitles Le Club AccorHotels members, regardless of their status, to benefit from earning x3points for a stay in one of the participating hotels in Le Club AccorHotels Loyalty program.This promotion is not applicable for hotels partners of Le Club AccorHotels.The number of bonus points for this offer is calculated according to the points earned by the member based on Classic status. 3. This offer is valid for a member’s stay from 03/01/2016 to 31/03/2016 in one of the participating hotels in Czech Republic (Prague, Ostrava, Plzen, Olomouc), Slovakia (Bratislava) and Poland (Bielsko-Biala, Jelenia Gora, Cieszyn), and booked between 01/01/2016 and 29/02/2016. 5. Any consecutive stays (check-out and check-in same day) in the same hotel, will be considered as a single stay. This single stay will be eligible once to the Triple as niceoffer.